We think of the 17th and 18th centuries as being so much closer to our own times in sensibilities than, say, the Tudor period. In terms of records, however, they’re very haphazard and far from modern. Prior to the 1800s there was little centralisation of records, for instance. Also within that time period is the English Civil War and the Interregnum, where everything was disrupted. It was another factor bringing complications to anyone researching family history. Very few people had the right to vote prior to 1832. The Poll Books, published throughout the 18th century, offer lists of who voted, as well as how they voted, which can be useful information if you’re from a wealthy background. Religion was an important part of life throughout this period. It saw the growth of the Dissenter movement, as well as recusant Catholics. They’re noted, but so are the faithful, approved clergy. They were recorded on the Association Oath Rolls. Those who suffered harsher fates would be fined for not conforming to the Church of England, and their names can be found in the National Archives in the Recusant Rolls. One area where close records were kept involved taxes, as this was where the government received its income. The Protestation, which wasn’t exactly a tax, came from the 17th century and is a very complete national document. It can be found in the House of Lords. Returns for the hearth tax as well as other taxes in the period, including the land tax and stamp duties, can all be found in the National Archives. Returns for the window tax will be in county records offices rather than available nationally. Again, most of these will only be useful where your ancestors were above the poverty line. Where they owned luxury items, additional taxes were payable on those, and these are also recorded in the National Archives. 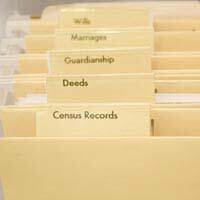 We tend to think of legal records as only pertaining to criminals. The 17th and 18th centuries were very litigious and many private lawsuits were brought by individuals. Any trial that happened at the Old Bailey is available online from the court’s website. Other Chancery records are available form the National Archives. As there were no church courts during the Commonwealth era, wills had to be proved elsewhere, and this took place at the Prerogative court of Canterbury, with the records available online from the National Archives. The Commonwealth, or Interregnum, was the period between the reigns of Charles I and Charles II. It brought many upheavals in custom and record keeping. They introduced the ideal of civil marriages, instead of church marriages, for instance. The problem was that these marriages weren’t noted in parish registers, or anywhere else, unless vicars did it much later, after the Restoration. Also during this period, supporter of the king had their estates sequestered, and had to petition to have their lands returned (the process was known as “compounding”). They had to provide documentary evidence of several things, including an inventory of the estate, and pay a fine, after which they’d receive one-fifth of the estate. Known as the Composition Papers, where they still exist they give a good picture of contemporary life and wealth. I’ve traced my paternal and maternal family members back to the early 1800s and late 1700s. How can I obtain earlier information? Hello, I'm looking to get hold of some images of 18th and 19th century Family Trees/Reports as well as 18th and 19th century Death Reports for a TV Production I'm working. Do you know where I could find something like this? Thanks! With the exception of records pertaining to baptism, marriage and death, most people from this period won’t appear by name in registers of any kind. This was still the era where most people lived under the radar, taxed but unnamed, while the upper classes are far more remembered on paper.